Recently, a reader posed a question about Sidney Rigdon's claims in the Messenger and Advocate that Joseph practiced polygamy. I wish to answer the reader's inquiry in this article. The claims in the Messenger and Advocate, published by Sidney Rigdon, that Joseph was a polygamist are very interesting. 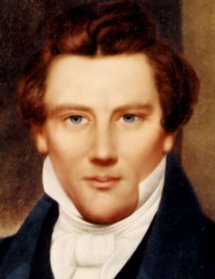 Because of Sidney's close relationship with Joseph from almost the beginning of the Church, including becoming a first counselor to Joseph in the First Presidency in March 1833, one would assume that the allegations in the Messenger and Advocate are true. After all, who better than Sidney should know the truth about Joseph and polygamy? And expectedly he did know the truth, but he did not publish it in the Messenger and Advocate. From Sidney's close association with Joseph, he knew that Joseph did not teach or practice polygamy. It was only after Joseph's death that Sidney changed his position as published in the Messenger and Advocate. So let us look at some of the events in Sidney's relationship with Joseph that point to Sidney's knowledge of Joseph's innocence and compare them to what Sidney published in the Messenger and Advocate. By doing this we should be able to see that what Sidney stated in the Messenger and Advocate was not reflective of what he knew about Joseph during their close association from 1830 to 1844. Sidney's and Joseph's relationship started very early in the Church and they quickly became close associates. They first met in December, 1830, when Sidney came to New York to visit Joseph and subsequently became his scribe for the process of correcting the King James Version of the Bible into what is known as the Inspired Version or New Translation of the Bible. Sidney's association with Joseph on this project continued until it was completed on July 2, 1833 (Times and Seasons 6:802), with the vast majority of the work being done in Hiram, Ohio. During this time they spent many days together under the influence of the Spirit working on this document, and they received great spiritual manifestations such as the open vision of the glories as recorded in D&C 76. In addition, they suffered great persecutions together, such as the time they were dragged from their homes by the mob and beaten and tarred and feathered. These types of experiences tend to create closeness between people and reveal both the good and bad about them. Thus, both Sidney and Joseph probably came to know each other very well during this time. Proponents that Joseph taught and practiced polygamy suggest that he did so as early as 1831 when he brought forth a revelation supporting this doctrine. To support their position they cite a letter written by W. W. Phelps to Brigham Young in 1861 which quoted parts of the alleged revelation. In addition, such proponents also indicate that Joseph's first plural wife was Fanny Alger who he allegedly married as early as 1833 in Kirtland, Ohio. If these events were true, Sidney Rigdon, with his closeness to Joseph in working on the Inspired Verson, would have had to have known about them. As adamant as Sidney was against polygamy after Joseph's death in June 1844, he would have also felt as strongly against it in the 1830s. Yet during this time he was silent on the subject. Similarly, the Messenger and Advocate in the mid-1840s makes no mention of polygamy existing during that time in the Church. In addition, Sidney was new to the Church as was everyone else. If Joseph was involved with polygamy, Sidney could have easily left the Church and returned to preaching in the Protestant world. But he did not. In fact, he was so convinced of the truth of the Restored Gospel that he accepted a calling to further responsibility in the highest quorum of the Church, the First Presidency. Because of Sidney's adamancy against polygamy after Joseph's death, his supportive actions for Joseph and the Church in the 1830s indicate to me that Joseph was not teaching or practicing polygamy at that time. Thus, I do not believe that the position of the Messenger and Advocate that Joseph taught and practiced polygamy came from Sidney's observations of Joseph in the early 1830s. Again, as adamant as Sidney was against polygamy after Joseph's death, I have to believe he would have also felt as strongly against it in the 1840s prior to his death. Interestingly though, up until Joseph's death, Sidney was silent about Joseph's alleged involvement in polygamy except for allegations surrounding his daughter, Nancy Rigdon. Again, Sidney's silence about polygamy indicates to me that Joseph was not teaching or practicing polygamy during this time. The allegations surrounding Nancy Rigdon are thoroughly covered in the article "Bennett's Sixth Letter, or the Essay on 'Happiness'" in Joseph Smith Fought Polygamy. I strongly suggest that all readers review the entire article. From this article, the issue was that "an unsigned letter favoring polygamy was delivered to Nancy, which Dr. Bennett published as his 'Sixth Letter,' claiming that it was a love letter from Joseph to Nancy." The letter was in Willard Richards' handwriting and Joseph denied he authored it. After Joseph told the Rigdons about Dr. Bennett's and Francis Higbee's involvement with Nancy, and after Joseph raised Eliza Rigdon, Sidney's daughter, from the dead by the power of God, Sidney believed Joseph about the letter. Sidney wrote a letter to the editor of a neighboring newspaper, the Wasp, which was printed in the September 3, 1842 issue. In the letter Sidney stated that Nancy denied that Joseph was the author of the letter. He also stated that Joseph had denied to him that he had authored the letter. There is and always has been one governing principle in the church of Christ, and that is that the Lord always has and always will, give his spirit to them that obey him. If a person is found without the spirit of God, it is because he or she is a transgressor. This holds good in all cases. Persons who through obedience have attained the spirit of God, and afterwards found without it is transgressor; for had they not been so, the spirit would have continued with them. Nothing but transgression can deprive a person of the spirit of God, and the nearer a person walks to God, the greater portion of the spirit he will enjoy. Because Sidney's belief was that the Lord only gives His Spirit to His obedient, he had to believe that Joseph could not have raised Eliza from the dead unless he was still the Lord's prophet and telling the truth. Hence, he made his public statement in August 1842 that Joseph was a true prophet and not a fallen one. And Eliza's statement under the Spirit about Bennett was confirmation to him that Joseph was telling the truth about Dr. Bennett and Francis Higbee. In May 1844, when Sidney defended Joseph in the suit brought by Francis Higbee, Sidney reaffirmed his belief that Joseph was innocent of polygamy and that he had told the truth in 1842 about Dr. Bennett and Francis Higbee. According to the article "Francis M. Higbee Sued Joseph for Five Thousand Dollars" in Joseph Smith Fought Polygamy, Higbee brought suit against Joseph allegedly for damages received from the Church's High Council 1842 investigation of Higbee's involvement in "'spiritual wifery' which was being practiced by Francis M. Higbee, Doctor John C. Bennett, and others. Testimony was given before the Council that Higbee had seduced at least six women, and that he had contracted a venereal disease from a prostitute, a French woman who had come to Nauvoo from the neighboring town of Warsaw." If Sidney believed or had evidence that Joseph was involved with polygamy, he could not have defended him for the following reason. This suit dealt in part with alleged scandalous events surrounding his daughter, Nancy Rigdon, including the alleged love letter written by Joseph to her favoring polygamy as mentioned above. Engaging Rigdon was wisdom on the part of both Joseph and Sidney, because Joseph had been accused by Francis Higbee of attempting to take Nancy Rigdon, Sidney's daughter, as a plural wife. Both Joseph and Sidney were aware that it would be necessary to discuss events relative to Nancy during the hearing, because there would be a reviewing of events in 1842. That was the year that Higbee was investigated before the High Council, and since he had been Nancy's suitor, her name had been discussed. This made it probable that her name would be brought into the testimonies in the hearing before the Nauvoo Municipal Court. In the trial Sidney stated, "In relation to the matters before the court I am unacquainted with[,] I was sick at the time but I have heard it talked of back and fro.... I recollect Joseph Smith came to me with a complaint against [Francis] Higbee and Bennet, and made affidavit that it was true; I have the affidavit in my house" (ibid). From the above, we see that in the 1840s, as late as May 1844 (one month prior to Joseph's death), Sidney Rigdon indicated it was true that Joseph did not teach or practice polygamy. Thus, I do not believe that the position of the Messenger and Advocate that Joseph taught and practiced polygamy came from Sidney's observations of Joseph in the 1840s. After Sidney's attempt to lead the LDS Church was rejected, he began to publish the Messenger and Advocate in Pittsburgh, Pennsylvania on October 15, 1844. He published the last issue in September 1846. He was the editor of this paper and as such was responsible for its content. (You may read the Messenger and Advocate online.) Having read all the available issues online, I found that the paper was strongly opposed to both the LDS Church leadership in Nauvoo at that time and its polygamy doctrine. The paper supported the position that Sidney was the true successor to Joseph as President of the High Priesthood and Prophet to the Church. In addition, many articles were published which both inferred and stated that the doctrine of polygamy was taught and practiced by Joseph and that he was a fallen prophet. On Thursday evening we gave the history of Nauvoo, and the events that led to the death of the Smiths, which, of course, we traced to the introduction of the spiritual wife system; for all that know any thing about it, that it was the introduction of that system which led to the death of the Smiths, and that if that system had not been introduced, they might have been living men to-day. An unexpected circumstance took place that evening, it was the arrival of brethren William Law and William E. McLellan, from Hampton, Rock Island County, Illinois. Brother Law addressed the congregation for some time, setting forth what he knew about the people and the affairs of Nauvoo; some of which were new to us. He settled the question forever on the public mind, in, relation to the spiritual wife system, and the abominations concerning it. As Joseph Smith and others had attempted to get him into it, and in order to do so had made him acquainted with many things about it that we never knew before. The whole combined put the matter at rest, and the public mind was quieted, and all doubts removed. The second article over his name was entitled "Tour East" and was published nine months later in the Vol. 2, No. 2 (December 1845) issue. Sidney stated that Joseph "had become basely corrupt, and put at defiance the laws of his God, to hide his iniquity from the world…." I assume he was alleging that Joseph practiced polygamy. We are well aware that the leaders of this people [Mormons], introduced many corruptions among them, and was the thing which gave their enemies power over them, had they not have become basely corrupt, no enemy would have had power over them. They introduced a base system of polygamy, worse by far than that of the heathen; this system of corruption brought a train of evils with it, which terminated in their entire ruin. After this system was introduced, being in opposition [to] the laws of the land, they, had to put truth at defiance to conceal it, and in order to do it, perjury was often practiced. This system was introduced by the Smiths some time before their death, and was the thing which put them into the power of their enemies, and was the immediate cause of their death. This system the twelve, so called, undertook to carry out, and it has terminated in their overthrow, and the complete ruin of all those who follow their pernicious ways. In all, there were 33 issues of the Messenger and Advocate published by Sidney Rigdon. All but two (which are still under construction) are available to read online at www.sidneyrigdon.com. Of the 31 issues available to review, only three articles indicating Joseph was involved with polygamy were over Sidney's name. In addition, 22 issues mentioned nothing about Joseph and polygamy. Prior to the March 15, 1845 issue, there were several unsigned articles indicating this position about Joseph. After this issue, there were no such unsigned articles. All of the articles that associated Joseph with polygamy, including those signed by Sidney, gave no evidence (i.e., events, dates, observer's name, etc.) to support their allegations. It is assumed that because Sidney and Joseph had a close association from 1830 until Joseph's death in June, 1844, the articles published in the Messenger and Advocate that Joseph was a polygamist and a fallen prophet, whether they were written by Sidney or others, were reflective of Sidney's knowledge about Joseph from his association with him. Thus, these articles are assumed to be necessarily true. However, I believe this is a false assumption. In the Vol. 2, No. 6 (June 1846) issue of Messenger and Advocate, Sidney stated that "we warned Joseph Smith and his family, of the ruin that was coming on them, and of the certain destruction which awaited them, for their iniquity…." Yet, as pointed out above, while Joseph was alive, Sidney never gave any indication that he did this or that he believed Joseph was involved with polygamy or that he was a fallen prophet. In fact, just the opposite occurred. Certainly, the Nancy Rigdon scandal would have been a time for Sidney to lose faith in Joseph. No father, especially a moral one with strong anti-polygamy feelings, would have supported a religious leader's attempt to seduce his daughter into polygamy. Yet both Sidney and Nancy claimed publicly in a local newspaper that Dr. John C. Bennett's allegations that Joseph wrote the unsigned love letter to Nancy were false. Shortly after this scandal, Joseph raised Eliza Rigdon, Nancy's sister and Sidney's daughter, from the dead. This experience was so spiritually powerful that Sidney had to know of Joseph's innocence of the allegations surrounding him. As he later wrote in the Messenger and Advocate, the Lord will only "give his spirit to them that obey him." In addition, the Spirit spoke to Sidney through Eliza indicating that Joseph was telling the truth about Bennett. As a result of these experiences, Sidney declared publicly in August 1842 that Joseph was a true prophet. I believe Sidney was thoroughly convinced that the allegations against Joseph were false and that Joseph was God's servant. Subsequently, in May of 1844, about one month before Joseph's death, Sidney defended Joseph in Francis Higbee's suit indicating that Joseph told the truth about Dr. John C. Bennett's and Francis Higbee's immoral conduct in 1842. Had Sidney truly warned Joseph about his "iniquity" as he stated in the Messenger and Advocate, he would not have defended Joseph against Higbee and indicated Joseph was telling the truth about him. Thus, from Sidney's actions throughout his association with Joseph, it is clear to me that while Joseph was alive, Sidney knew that Joseph did not teach or practice polygamy. He had no personal knowledge to indicate Joseph was involved with polygamy and the Lord had confirmed to him that Joseph was still His prophet and obedient to Him. Sidney's later "conversion" to the position that Joseph was a polygamist and a fallen prophet was obviously not based on his observations of Joseph during the 14 years of his close association with him and it was not based on revelation from the Lord. Therefore, it should not be assumed that the information published about Joseph in the Messenger and Advocate was necessarily true because of any knowledge that Sidney had from his association with Joseph. The information published about Joseph in the Messenger and Advocate must stand on its own merits and nothing else. All of the allegations made in the Messenger and Advocate about Joseph, whether by Sidney or others, are totally unfounded. They give no specific examples of events, dates, times, or individuals involved. Thus, because they cannot be corroborated, they are not proof of anything. Truly, from Sidney's close association with Joseph he should have known of at least one event to support his allegations. He did not even mention the letter to Nancy, which if Joseph had written it, would have been perfect to discuss as proof that Joseph "had become basely corrupt, and put at defiance the laws of his God, to hide his iniquity from the world…" (Messenger and Advocate, June 1846). Oddly enough, this statement itself was in direct opposition to the one he made in public in Nauvoo in August 1842 after Joseph had raised Eliza from the dead. Because of Sidney's close association with Joseph, the fact that he did not mention any specifics about Joseph's involvement with polygamy indicates to me that there were none to mention, which is further proof of Joseph's innocence. It is interesting to me that Sidney only wrote three articles over his name in which he indicated that Joseph was a polygamist, or a fallen prophet, or both. As indicated above, the first was published in the March 15, 1845 Messenger and Advocate. Prior to that issue there were signed and unsigned articles supporting this position about Joseph. Because Sidney was the editor of the paper, he would have had to have been sympathetic to this position about Joseph to have allowed these articles to be printed. Thus, it is possible that some or all of the unsigned articles could have been authored by him. If the unsigned articles were written by Sidney, the question comes to mind, "Why didn't he put his name to them?" I'm not sure of the reason, but possibly because, at that time, he was not thoroughly convinced of this position about Joseph, considering his experiences with Joseph while he was alive. From what Sidney reported, I believe he was finally convinced from this point on of Joseph's involvement in polygamy. As I interpret his report, Law gave new information about polygamy in the Church and "settled the question forever." He stated things that Joseph had taught him about polygamy which "we never knew before." Law removed "all doubts" that Joseph was practicing polygamy. In addition, his subsequent two articles and the publishing of no unsigned articles confirm the solidifying of his belief. However, Sidney's belief that Joseph was a polygamist came from believing William Law and others but not from his association with Joseph. While at first it might appear that Sidney Rigdon's publication of the Messenger and Advocate is proof that Joseph taught and practiced polygamy, closer scrutiny indicates it does not. First, there is strong evidence that during his association with Joseph he knew Joseph was innocent of the polygamy allegations. Second, the statements made in the Messenger and Advocate against Joseph were not supported by any facts. Third, Sidney's final "conversion" to the belief that Joseph was a polygamist came from William Law in February 1845 and not from his first-hand association with Joseph. I am uncertain why Sidney would allow the testimonies of men to change his position against what he knew and publicly testified to be true. Since Joseph was dead, maybe it was easier to say he was a fallen prophet than to defend him and prove his innocence. Maybe this disassociation with Joseph made it easier to start and run his church. Maybe such a position legitimized his new church in the eyes of the "Joseph" critics. Whatever his reason, the fact remains that during his association with Joseph, Sidney knew Joseph was innocent of teaching and practicing polygamy. Thus, the position against Joseph expressed in the Messenger and Advocate was, in the words of Shakespeare, "full of sound and fury, signifying nothing" (Macbeth: Act V, Scene V). Sidney was also probably very upset that he wasn't allowed to become the next Prophet & thus wanted the world to know that the Church under Brigham Young was not correct. That resentment coupled with the 'Laws' pressure & insistence that Joseph was guilty of polygamy were probably enough to cause Sidney to succumb to believing Joseph had secretly lived polygamy. Above all, it appears based on other indications, that Sidney lost the Spirit in those days following Joseph's death & thus that would be the main reason he easily fell for the false accusations about Joseph. For it appears that then & now, that most men easily fell & still do fall for the falsehoods that Joseph preached & practiced polygamy. If one has the Spirit it will explain many many reasons why it is absolutely impossible for polygamy in any form, to ever be a true principle. And the Spirit will also show us that Joseph did not fall for polygamy & thus wasn't a fallen Prophet. Just a thought - but maybe Sidney Rigdon was telling the truth as he remembered it. Once Sidney was "converted" by William Law to the Joseph was a polygamist allegation - it would be only natural for Sidney to again have issues regarding the Nancy story. At the time of Bennett's claims, Sidney would have likely told Joseph that the practice of polygamy would was iniquitous and would bring ruin upon the church and Joseph's family. It is my theory that Sidney was only remembering something he had probably once said to Joseph about polygamy. Consequently, that is why Sidney would not include any supporting facts in the new allegation. What could William Law have possibly said to settle "the question forever" with "all doubts removed" of Joseph's involvement with polygamy? That seems to be a very high hurdle for a speech that introduces things "we never knew before". What could possibly be so persuasive? Are there any other records from those in the congregation of what was said to them? It seems that Sidney Rigdon eventually accepted the idea (contrary to his own personal knowledge) that Joseph had somehow succumbed to corruption "sometime before [his] death", which corruption Joseph had hidden from Sidney. Yet, at the same time, this apparently in no way invalidated (in Sidney's mind) the previous works and teaching of Joseph given that Sidney attempted to carry on the work through his own faction and maintained the truthfulness of the BOM even until death. What kind of evidence could Law have presented that could be consistent with these facts? It must have been something that did not call into question Joseph's other works (and maybe even bolstered his prior works so as to gain trust from the congregation), but focused on personal weaknesses or failures that could be understood independently of Joseph's other works. I think you raise some great points here. While my husband and I were discussing this, he pointed out that it's unfortunately for Joseph because there is no way to ever prove that he definitively didn't do it, and even for people who had close associations with him, they could always just be told that it had been practiced without their knowledge. And once enough people claim it's true, it seems like some who had at first denied it were convinced, but not based on their own experience (I'm thinking here of William Marks and Sidney). However, putting all of this aside, if we believe that Joseph was a true prophet of God and he restored His true Church to the earth, don’t you think that with all of the evidence supporting the position that he was not a polygamist, we ought to at least give him the benefit of the doubt that he was telling the truth of his innocence? I certainly do and that is why I write this blog. Thank you so much for your comment. May God always bless you in your search for the truth. Now that the LDS church has come out publicly that Joseph Smith practiced not only polygamy but also polyandry how do you feel about your conclusions? Thank you for your comment. Their public statement doesn't change my opinion. See my articles "The LDS Church's Plural Marriage Statement" and "Helen Mar Kimball--Was She Joseph's Plural Wife?"